In 2004 our vision was to establish a sustainable winery and vineyards in Beaver Valley, with a long term goal to develop a successful wine industry in the Georgian Bay region…. We now know this is achievable, by experimentation (trial and error) we have learned a great deal from nature on which grapes varieties and sites are most suitable, along with best practices in both viticulture and wine making we have made some very credible wines for a new and evolving cool climate wine region. Looking forward, our winemaking vision will be based on our learnings over these past fifteen years. We are now immersed in developing a wine portfolio that offers consumers two unique styles of Ontario wines. Quality wines that are quite different in style and recognisable by their own unique expression of terroir and also by their varietal typicity and focus. Wines we would like to believe will be recognised as some of the best in Ontario in the coming years. Beginning in 1998, the founding partners John Ardiel, Robert Ketchin and Murray Puddicombe began conducting test sites to gain an understanding of the best potential vineyard sites, viticulture methods and grape varieties for the emerging cool climate region of Georgian Bay. In 2004 John Ardiel planted and established a five acre commercial vineyard at Ardiel Acres on the west side of Beaver Valley. In 2005 the partners purchased land at Victoria Corners and then planted twelve more acres in 2007, now the home site for Georgian Hills Vineyards & Winery. In total, the two sites by 2012 were producing over 30 tons of grapes, made up of European Vinifera varieties – Riesling, Pinot Gris, Gewurztraminer Chardonnay, Gamay Noir, Pinot Noir, as well as popular French American Hybrids such as Seyval Blanc, Vidal Blanc, Maréchal Foch and Baco Noir. 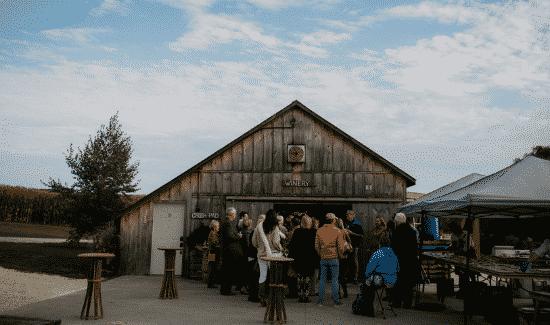 The old barn on the property was renovated and refurbished to become the home winery and since 2009 fall vintage we have been making wine at the vineyard site. On September 30th 2010 the tasting room and retail store were officially opened.